Dear reader we have discussed many posts about shallow foundation; here our concern is plain concrete and masonry unit foundation. At first we will start with plain concrete; except light-frame structure, the edge thickness of such foundation supporting walls should not be equal or greater than 203 mm (8 inches) when supported on rock or soil. When such footing support IBC occupancies group R-3, a reduction in edge thickness of up to 152 mm (6 inches) can be provided. But the footing should not be extended from both sides of supporting wall by a distance more than thickness of footing. Dear reader we will discuss about plain concrete footing elaborately, here we have just included IBC provision. 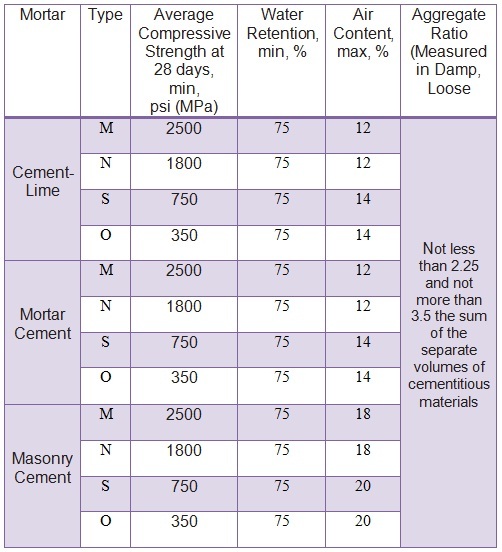 Regarding dimension of masonry-unit foundation, we can include, as per IBC, that the mortar used in construction should comply with type M and Type S. Following table provides properties of different mortars according to ASTM C270. ASTM C270 is included here as IBC also referred to this standard. The depth of footing should be equal or more than 2 times of projection beyond column, wall and pier. The width should be equal or more than 203 mm (8 inches) wider than wall supported by them. Regarding offset, code recommended to provide a maximum of 38 mm (1.5 inches) for each course in foundation walls (stepped up) from footing. 38 mm is considered for laying single course when double courses are applied 76 mm is recommended.